What “Michigan’s Comeback Kid,” a television ad first aired during the Super Bowl promoting Rick Snyder for governor. The ad is taken in large part from a five-minute web ad introduced in September. 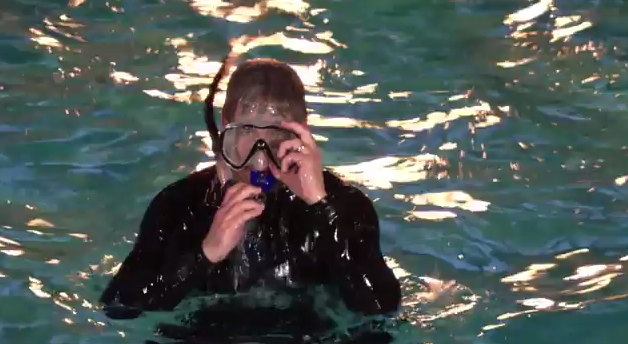 It begins with Snyder underwater in snorkeling gear, and proceeds through various images of Michigan, pushing a theme that the state is in better shape now than before Snyder took office. Though the ad doesn’t specify the tax, Snyder has in the past referred to the Michigan Business Tax as “job killing.” Snyder and the legislature repealed the MBT in May 2011, replacing it with a 6 percent corporate income tax that cut taxes by $1.7 billion. Michigan’s unemployment rate has dropped 2.2 percentage points since May 2011, but had also been dropping before the MBT repeal. More than 2 ½ years after the MBT repeal, Michigan is ranked 47th among the 50 states in unemployment rate. The statement is based on a University of Michigan economic forecast that is not available to the public. Depending on how it is sliced, Bureau of Labor Statistics data indicate job growth since Snyder took office ranging from 182,000 to 291,000. The ad does not offer viewers a full perspective on the jobs figure. While jobs are increasing, there are still about a half million fewer jobs in Michigan today than in 2003. Since Snyder took office in January 2011, the unemployment rate has dropped from 11.3 percent to 8.4 percent; but the state has also fallen even further nationally in unemployment rankings. Michigan ranked 46th in unemployment rate in January 2011, and ranked 47th in December 2013. The ad cites a 24/7 Wall St. article from Jan. 3, 2013 that ranks states by how much their unemployment rate has dropped from its peak in the recession. Michigan’s unemployment rate peaked at 14.2 percent in August 2009, 17 months before Snyder took office. In those same months before Snyder actually became governor, the state’s unemployment rate dropped 2.9 percentage points from its peak. Since Snyder took office, the unemployment rate has dropped another 2.9 percentage points. So half of the percentage point drop in unemployment took place before Snyder became governor. There is enough gray area on this subject that Snyder can accurately claim education funding is up, while Democrat gubernatorial candidate Mark Schauer can just as accurately claim school funding is down. Snyder claimed in his State of the State address, though not in the Super Bowl ad, that K-12 spending had increased by $660 per student since he took office. That number reflects total appropriations, which have indeed risen from $12.98 billion in fiscal year 2011 to $13.36 billion appropriated for the current fiscal year, while the number of students has declined. A lot of that increase has gone toward teacher pension liabilities, which is funding that may or may not be prudent but is not money that is flowing into classrooms. The state’s basic per pupil foundation allowance is down since Snyder took office, from $7,316 in 2010-11 to $7,076 in 2013-14. This spot rates a technical foul for touting job numbers that weren’t entirely earned on Snyder's watch. The ad takes credit for Michigan being No. 1 in recovery from the recession based partly on a recovery that had begun before he took office, and cites jobs growth while Michigan continues to trail the pack in unemployment rankings among states. Correction: An earlier version of Bridge’s Truth Squad report on Gov. Rick Snyder’s Super Bowl ad, published Monday, inaccurately cited statistics on the drop in the state unemployment rate by referring to them as “percent” drops. We should have labeled them “percentage point” drops. Also, in analyzing whether Snyder was taking credit for a jobs recovery that began during Gov. Jennifer Granholm’s administration, Bridge mistakenly failed to credit Snyder for job numbers in January 2011, his first month in office. As a result, the report indicated that most of the jobs recovery (in percentage points) took place on Granholm’s watch. In fact, the drop in the unemployment rate was 2.9 percentage points under Granholm, and 2.9 percentage points under Snyder since the height of the recession. These corrections do not change Bridge’s call of a technical foul on Snyder’s campaign for touting job numbers that weren’t entirely earned on his watch. That said, Bridge regrets the errors and corrects them in the report today. You MISSED A BIG ONE guys. Michigan has had a BALANCED BUDGET ACT since 1963! Therefore, the $1.5 Billion deficit did not exist. Each year the budget was balanced, including under the last 3 Governors!!! We had an anticipated $1.2 Billion HOLE in the budget for the next Fiscal Year (aka, a forecasted shortfall), which was caused by spending $1.2 Billion to pay for the tax cuts to business. I'm not sure where they are getting the 1.5 from, because even with a $1.2 Billion cut, we never were at a $1.5 Billion Projected Shortfall. Now i may seem to be biased but I am coming from a center approach to reviewing these ads, Again by your own definitions " A statement that could easily be misconstrued, but is generally truthful." That would be a warning. Let us look at your statements under review, “Gov. Rick Snyder killed job-killing taxes”. Did he not eliminate the MBT, yes he did!! so there is nothing to review. “Michigan gained 220,000 private sector jobs” He includes his resource from University of michigan and you are also using the BLS that with your own admission says 291,000 , I believe the Snyder folks using 220,000 would be a good conservative number. Or is Michigan truth squad is saying that they should use the BLS number which would be estimated higher?? “Education funding is up” is it not true, yes it is true. So again what's to review. “We’re number one in states that have recovered the most from the great recession” this comment is a perfect definition of a "Warning"." A statement that could easily be misconstrued, but is generally truthful." I respect the Michigan truth Squad but puts me on edge to not take these calls as serious no matter which party. on another note, Maybe add "deserves additional explanation" in Warning Section. I believe that would also strengthen the "How we call it scoreboard". You assume that because Snyder said it than the MBT was a job-killing tax. His word doesn't make it true. The jobs numbers he mentioned were from a forecast study not available to the public- not good enough. So you said the BLS numbers were even better-also not good enough because you just assumed the high end when it could have been the low end. Lastly, putting Monet into unfunded teacher pension plans is not spending on education it's spending on neglected responsibilities that the state already had. MBT was a job killing tax and that is a fact not a thought. The MSU forecast is available to anyone who wants to read it. The BLS numbers on the low end is 198,000 new jobs created. Obviously you have no clue what you are talking about Pension and health payments have always been counted as a classroom expense. Again No Gray Area. @ Mike S - MBT had the biggest impact on small businesses - when you talk to them, the credit they received or elimination of the tax did not allow them to hire new staff - if they even needed additional staff based on their business model. The fact the CIT is dramatically under-performing and we still have outstanding MBT credits (for years to come) as a negative budget item (more than $450M this year alone) clearly says Michigan wrote a check it can't cash without pain. We can argue about who did what when - putting politics aside we employ 500,000 fewer people in Michigan today and many of those jobs won't come back - autos produced today with 80% of the previous labor. That's a problem. U of M study - not MSU and not available on their websites. Finally, MPSERS pension costs didn't "belong to schools" until 1994 Proposal A and the costs have always been counted outside of our instructional costs - always!!! "There is enough gray area on this subject that Snyder can accurately claim education funding is up, while Democrat gubernatorial candidate Mark Schauer can just as accurately claim school funding is down." Sorry, Bridge, but there's no gray area here. As the Detroit Free Press (no friend of Snyder's, by the way) pointed out on Sunday, education spending HAS gone up under Snyder. Period. Period. Period. No gray area. Mark Schauer can NOT accurately claim that school funding is down. I'm calling a technical foul on the Michigan Truth Squad. In the political arena " truth", like beauty, is often in the eye of the beholder. Who are the individual members of the Truth Squad? What are their political affiliations (candidate endorsements, employment experience, recent & past campaign contributions, etc.)? Will the members of the group be the same throughout 2014? And are decisions of the group made by consensus or majority rule? Monday there was a beautiful winter sunrise in Michigan. Thank you, Governor! Sorry, John T., but there is an ENORMOUS grey area in Snyder's claims regarding "education spending." The fact that overall spending has increased yet per-pupil expenditures are down is an ambiguity that exceeds the ability of sound bites to explain. The fact that what used to be K-12 spending now has to pay for higher education and a portion of pre-kindergarten is a fact that renders the "increase" far less impressive than the raw numbers suggest. The purpose of the Truth Squad is not to accept a claim as "Truth" simply because it may literally be true under a very narrow, hypertechnical, sycophantic interpretation; it is to call out the ways in which the statement may be misleading by omission, intention, confusion, or oversimplification. And I think the Truth Squad has done a very large public service by showing how the Governor's (as well as likely opponent Mark Schauer's) claims distort the underlying facts. Everyone forgets the big kid on the block in the Michigan economy. Governors aren't responsible for big gains or losses on the economic front--it's linked to the rise and fall of the domestic auto industry. I have to admit that I seldom read the ‘Truth Squad’ reports. There are a few of reasons for this, it reports intermittently thus doesn’t help readers develop a sense of the ‘Truth Squad’, offers no continuing view or patterns, it doesn’t offer any criteria that sets a level of accuracy, it disappears until a new season giving those in office or seeking office a window of obscurity thus a clean slate when the next cycle comes around, it fails to frame things in a manner that fits the various audiences it is trying to inform, it seems internally focus (more about itself) then the decision process it seems to be trying to enhance. I expect that these are volunteers who are making the extra effort to help inform voters/public. I truly appreciate that for it takes more effort than the vast majority of us are willing and able to do. I would like the ‘Truth Squad’ to become more effective and help voters/public to have a better understanding of those competing for their support. I believe in accountability, in being able to evaluate programs, practices, ideas so we can build on the successes, improve the ones with potential, and replace the ones that aren’t effective. I would encourage looking at their reporting as a continuous effort not just an election cycle, claims are made during election, promises of results are made. If only those weren’t monitored accuracy for a short period that allows the promisors to begin with a clean slate each cycle while their efforts, their claims may quite possibly be proven inaccurate during that period between cycles. The reality is if people keep making erroneous claims we can gain from knowing that. That can be critical information. I would encourage the ‘Truth Squad’ to consider establishing criteria/index for their findings so the voters/public can see and validate the level of accuracy of the claimant being reported on. As an example there maybe levels of inaccuracy or accuracy, typing errors that maybe a level 1, a fabrication about a candidate maybe a 5, and there would the descriptions of those levels and the ones in between so readers could be better able to appreciate what the ‘Truth Squad’ is reporting. Would encourage the ‘Truth Squad’ to try to see their reports through the eyes/hearing/thinking of the various audiences they are reaching. As an example, if there are various groups providing ads the ‘Truth Squad’ monitors then a visual presentation of the findings on their ads would help the voters/public understand patterns of credibility for those groups. Reading a report on an ad every month or so is at best a snapshot and seldom is attached to the provider of the ad, however, if with each report on that organization’s ad there was a graph that include previous findings then the reader could better appreciate the accuracy and consistency of the that organization. Regularly reporting such graphs of each organization that the ‘Truth Squad’ monitors side-by-side with other organizations could better frame the issues of accuracy helping the readers and helping the organizations see how they may need to change their practices. This could be done by employing a simple indexing. When creating a new service much effort and focus has to be put in developing the methods and practices to provide to a quality service. What can happen is that focus is so intense that it carries on to the subsequent stages of the service. The quality and culture of the service is now well established, I encourage the ‘Truth Squad’ to now look for ways to enhance it, by improving its effectiveness for readers, its consistency and presence keeps it credibility present rather than having to re-established each cycle upon its return, and looking at how the practices can become more open an inclusive to the readers. Thank you, to all of those who make the ‘Truth Squad’ a valued service to the readers.